E-Capcom updated today to show off the cover artwork for the next volume of Sengoku Basara Magazine, scheduled for release on 27th November 2014. Surprisingly, they've used a new anime-style image of Sakon for the placeholder artwork. 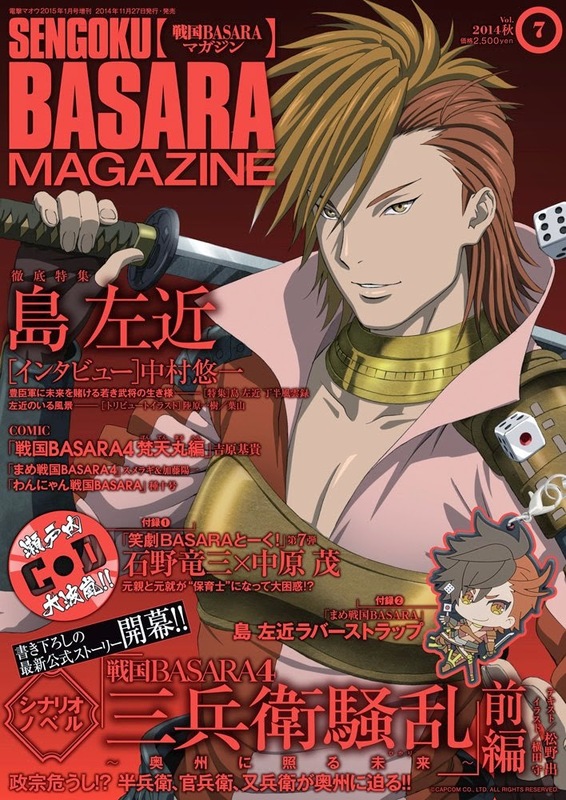 The listing notes that the next issue will feature the first part of an official 'scenario novel', a serialised story by the game's scenario writer Matsuno Izuru titled Sengoku Basara 4: Sanbee Souran ~Oushuu Ni Teru Hikari~ Zenpen ('Three '-bee' Mayhem ~The Future Which Shines On Oushuu~ Part 1'). The story will involve Hanbee, Kanbee and Matabee clashing with Masamune, from the sound of things. Yokota Mamoru will be providing illustrations and the 'scenario novel' format is supposedly more dynamic and easy to read than a normal story. Interesting! There will also be a report from the upcoming Butai Sengoku Basara 4 stage play with an interview from the four graduating cast members (Nakamura Seijirou, Hirose Yuusuke, Yoshida Tomokazu and Murata Youjirou), a look back at Judge End, an article where series creators KobaP and YamamotoD answer 26 questions asked by fans, a vote on a new blanket design to be released in late February 2015 and more. The Showgeki Basara Talk! Motochika & Motonari No Maki Vol. 1 CD will feature seiyuu Nakahara Shigeru (Mouri Motonari) and Ishino Ryuuzou (Chousokabe Motochika). One of the special challenge skits will feature the two of them taking care of children this time. The serialised manga will include the same three titles again: Sumeragi's Mame Sengoku Basara 4 (Shucchouban), Yoshihara Motoki's Sengoku Basara 4: Bontenmaru-hen and Tane Jugou's Wan-Nyan Sengoku Basara. 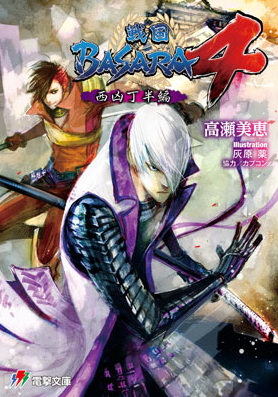 The cover artwork has been revealed for the second Sengoku Basara 4 novel, Sengoku Basara 4: Saikyou-Chouhan-hen ('Western Misfortune/Cho-han Arc'). Takase Mie is credited as the writer and Haibara Yak will be providing illustrations when the book goes on sale on 11th December 2014. 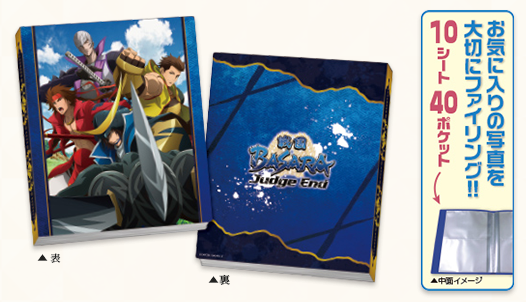 We can now finally see full-sized pictures of the upcoming Mame Sengoku Basara goodies which will be released at the end of November 2014. There will be wooden straps (¥600) and chirimen crepe mirrors (¥800) featuring a choice of Masamune, Mitsunari, Yukimura, Ieyasu, Keiji, Sakon, Katsuie, Shikanosuke and Matabee illustrations. In addition, the new CG illustrations from Sengoku Basara Magazine are going to feature on acrylic pass cases with Masamune, Mitsunari, Motochika and Motonari designs (¥1,200). Finally, there will be a Sengoku Basara Judge End photo album for storing your favourite bromides (including, perhaps, the bromides which will be offered as prizes in the upcoming Ichiban Kuji lottery?). It will be released on 29th January 2015 for ¥1,000.